Think you and your partner are destined to emotionally react to the same old triggers, until “death do you part?” Thanks to research in the field of neuroplasticity by Dan Siegel, Richard Davidson, and Jon Kabat-Zinn to name a few, we now know it’s possible to change our mental patterns to achieve a different outcome. Neuroplasticity is the brain’s ability to reorganize itself by forming new neural connections. Reorganization can be done in a number of ways; however, two extremely effective means are through meditation and mindfulness. Becoming mindful and aware can help you to identify and observe the patterns in your relationship that may be contributing to feelings of anxiety, disconnection, frustration, and loneliness: your partner perpetually connected to their cell phone instead of you; days-on-end where one or both of you come home from work, too exhausted to connect over the events of the day; your partner coming across as disinterested or apparently too tired to truly listen to what you have to say and share with them. Perhaps your own critical thoughts and defensiveness are taking a toll? These scenarios and more can lead to escalated misunderstandings, stonewalling, and ultimately, the death of your relationship. Paying close attention to what is going on within you, and within your heart, will give you the ability to be mindful and present to what you are experiencing in the moment. It’s also important to regularly unplug from technology, so that you can be fully present and listen to one another. In this space, you can then come from a place of responding to your partner with calmness and ease, rather than reacting and emotionally “shooting from the hip” without giving forethought to what you say and the actions you take. 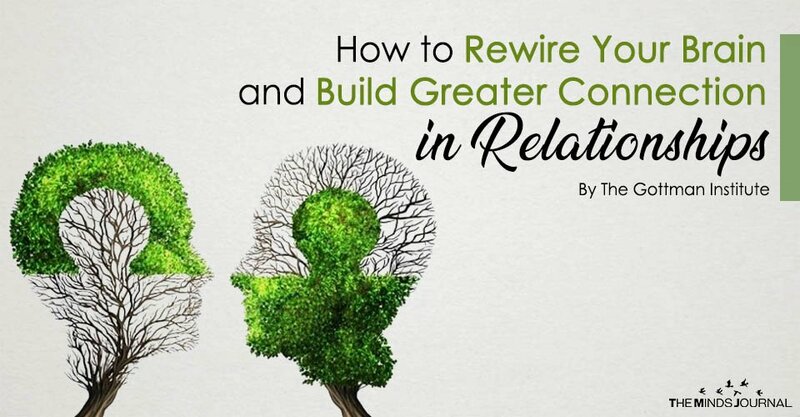 Here’s a short, yet powerful practice to help you figure out what’s necessary to feel connected with yourself and with your partner, so that you can rewire your brain. Gently close your eyes and let your attention focus inward for a moment. Feel your breath, your heart, and the life-energy within your body. Feel yourself – fully here in this moment – in a loving and caring way. Let yourself become open and aware of what is going on inside of you. Observe this with acceptance, kindness, and compassion, and a deep understanding of wanting to know what is going on within you. Relax and let yourself imagine what would help you. Pay close attention and be mindful to what comes up, tuning into those inner whispers that are trying to tell you something. Allow yourself to feel and embody these emotions, thoughts and actions. Most importantly, really focus on channeling love toward your partner and yourself. After you have sat with what has arisen for a few minutes, take a few full breaths and come back to the present moment. Practicing mindfulness meditation like this will make you aware of the destructive patterns in your relationship and even your life in general. It will help you to cultivate new healthy habits and patterns of communication, and ultimately serve to reorganize and redirect your neural pathways. Healthy habits, affection, and bonding are essential for your physical, mental, and spiritual well being. When you and your partner feel mutually nurtured and cared for, your neural pathways in your brain fire, leading to feelings of love and greater connection. Remember, you are in control of your relationship’s emotional and physical destiny! It just takes time, practice, and compassion – for yourself and your partner. The Gottman Institute uses over 40 years of research on thousands of couples to provide research based tips on how to make love last. Our research has saved troubled relationships and strengthened happy ones. Get your free copy of 7 Signs Your Relationship Will Last by clicking &amp;amp;lt;a href=&amp;amp;quot;https://www.gottman.com/subscribe-for-free/&amp;amp;quot;&amp;amp;gt;here&amp;amp;lt;/a&amp;amp;gt;. Reasons Why The Quiet Ones Have the Strongest and Sharpest Minds: Never Underestimate Them ! You Have to Love Yourself Before You Love Someone Else – Why It Won’t Work For You?